The antenna can be built with aluminium or copper of 3 to 8 mm diameter. It should be noted that the NAROD elements are needed only if you want to receive VHF band. 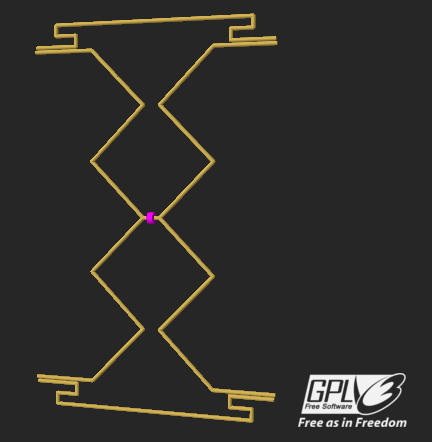 The gain of this antenna is shown below (4nec2 simulation). 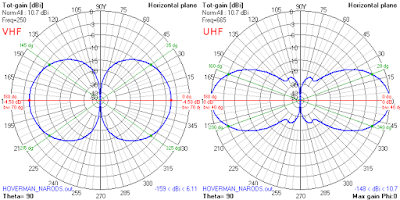 The antenna impedance is 300 ohms balanced. A balun should be used. You can buy one or you can build one similar to those in commercially available antenna amplifiers. If you don't have the parts for it, you can omit it and connect the cable directly, although it is highly recommended to use one. Detailed instruction about how to build this matching transformer can be found at: Make a wideband antenna matching transformer. The performance of the antenna can be improved by adding some reflectors. See the designs here. No reflector variant is easier to build and receives two sides. 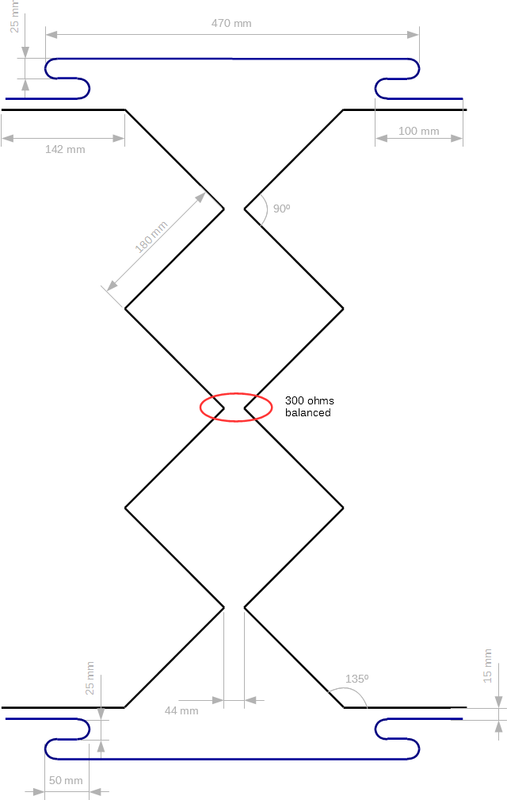 See its radiation pattern below. 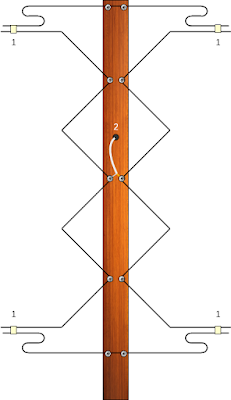 A construction variant is shown below. 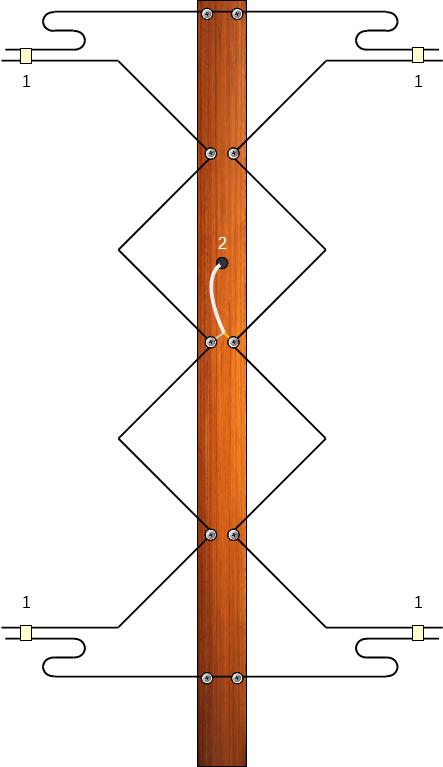 The antenna sits vertically, as shown. Construction detail. 1. Duct tape 2. Pass through hole to prevent a cable position that would allow water to enter and oxidize the cable wires. For an easy way to build those NARODs (the horizontal "hat"-like elements) see unclesam's bending jig on Instructables . Have you built this antenna? How does it perform for its simplicity? Nikolai Mladenov. nikiml's Antenna pages. 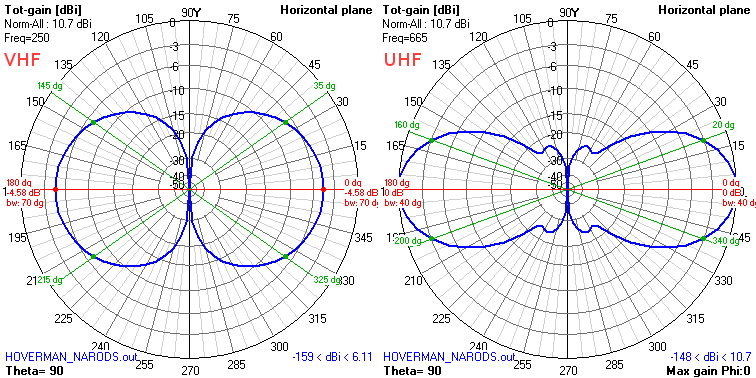 SBGH-6 Tophat NARODs for VHF-Hi (on WayBack Machine - unfortunately, full size images were not indexed). unclesam. NAROD Bending Jig for Gray Hoverman TV Antenna (CC-BY-SA). Available on Instructables.